Farinata, as it's known in Italy, or Socca (the French equivalent), is a crispy flatbread made with chickpea flour. In it's native lands, farinata is a quick snack sold by street vendors. We first saw a recipe several years ago in the New York Times Minimalist column. Recently, farinata popped up on David Lebovitz's website and My Man's Belly. If you're wondering why everyone's so excited about farinata, imagine a warm, crispy pancake full of smoky flavors that you cram into your mouth, oil dripping down your fingers and onto your chin. This is comfort food Mediterranean-style, best eaten straight out of the oven. Don't even bother with a plate, just wrap these in some napkins or paper towels and dig in. Best eaten while standing. Combine farina, salt and pepper. Slowly add 1 cup lukewarm water and whisk constantly. Whisk until there are no lumps. Mix in 2 Tbs olive oil, then cover bowl and let sit for at least 3 hours or up to 12 hours. Batter will thicken to the consistency of heavy cream. Preheat oven to 450°, and move shelves to top and second levels. 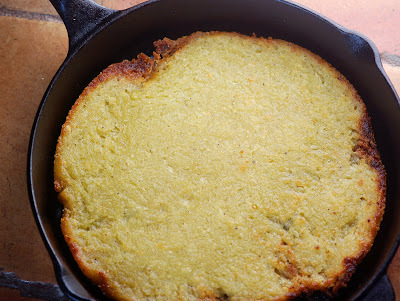 Place cast iron skillet in oven to heat up for about half an hour. Add onion, cumin and cheese to batter. 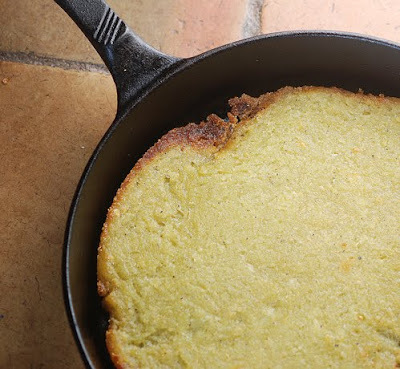 Thinly coat bottom of hot cast iron skillet with olive oil, about 1 Tbs, then pour in batter. Bake on the second shelf until farinata is starting to firm in the middle, about 15 minutes. Raise temperature to 500° and move skillet to top shelf and broil until edges are crispy and top is starting to brown,about 5 minutes. Remove immediately from skillet to stop the cooking process. Serve slices on paper towels or napkins to absorb the oil. Oh wow, this looks great! I almost bought chick pea flour the other day, didn't know what I was going to do with it. Now I'm kicking myself, because i would go make this for breakfast if I had it on the house! Oh, a crispy flatbread would be a total hit at my house! Excellent with manchego! Ooooh, we always have Farina in the house because my husband loves it for breakfast. Can't wait to give this a whirl! after-swimming lesson treat in the old city of Nice when I was a child. It dripped with olive oil and sea salt and was so delicious. I'll have to try this version. Thanks! I keep meaning to make socca; I think your photographs convinced me. I'm a sucker for anything made in cast iron. Waw!! This looks fabulous!! I think it is a great ide to add the Manchego cheese,....mmmmmmmm!!! You know what, I can REALLY smell that farinata from your picture! it looks SO tasty and warm and... aww!!! I'm afraid we don't have Manchego cheese over here though, what does it taste like? Thank you! Wow, I am really looking forward to trying this!